Using the news for binary options signals. Without doubt news is an important part of the financial markets and can have a large impact on the prices of assets. Some will tell you to avoid the news, others will tell you to embrace it, what traders need to remember is that trading the news can be very difficult if you are not prepared. When it comes down to it whether to trade the news or not is more based on your experience, knowledge, strategy and risk tolerance rather than the news itself. I am not here today to convince you to trade or not trade news events, but to inform you of the different types of news events, how they may affect the market and how you can apply it to your binary options trading. Believe it or not there is more than one kind of news despite what many articles will lead you to believe. Seriously, the basic definition of news is this “newly received or noteworthy information about recent or important events”. What the definition fails to reveal is that some news is important for only one asset, some news is important for an asset class and some is important for the broad market in general. . . and that some news is nothing more than fluff to be ignored. The types important for binary options traders, for any trader actually, are these; earnings news, economic news, fundamental news and what I will call “random” news. Some news may even be placed in more than one category. Fundamental news is information regarding the underlying conditions affecting a market, if you are not familiar I suggest you learn your fundamentals before trying to trade the news. As a group, it is the one most likely to include other forms of news but is also the least likely to reveal true change. It can include things like political changes such as a change in leadership or new taxes, it also includes central bank policy and supply/demand balances when talking about commodities. In terms of your trading, consider the fundamentals to be the canvass on which the economy functions and all other news as the picture being painted on that canvass, or, fundamentals set the underlying trend and all other news provides entry points for bullish or bearish trades. When fundamentals deteriorate companies will have a harder time making money, but safe haven assets like gold, the Swiss Franc and Japanese Yen may do very well. When fundamentals improve the economy will improve and by extension so too will corporate profits. In terms of forex trading fundamental news has the greatest impact on exchange rates and trends in currency valuation. This fundamental news from Reuters is about central bank interest rates, outlook cuts are a surprise. This is news that reveals earnings results of publicly traded companies. It could be the quarterly earnings report, or it could be earnings guidance (information provided by the company about what to expect in the earnings report) or it could be fundamental news that affects the earnings potential of an individual company, sector or asset class. Since earnings, and earnings growth, are what drives the equities market this type of news is perhaps the most important for those of us trading individual stocks and stock indices. When earnings news is positive, that is, when earnings news reveals that profits are growing or even that profits are falling as fast as expected it is good for the market and asset prices may rise. When earnings news is negative asset prices may fall. This earnings news is a report of Ford’s record profits in the fourth quarter. This is news pertaining to the economy such as, but not limited to, job creation, unemployment, manufacturing, home sales or GDP growth. This news reveals the health of the economy on a broad or sector specific levels and can give clues into the earnings potential of a sector, or into the purchasing power of a country or region. This news can also be categorized as fundamental news although economic data will rarely, if ever, alter the underlying conditions of an economy. When economic news is good it can cause asset prices to rise, if bad it can cause them to fall because the health of an economy is directly related to the earnings potential of businesses. Economic news also has a large impact on currency and forex trading because it can help to strengthen or weaken or a currency. For example, if US data is strong it can strengthen the dollar and that will move any forex pair that includes the dollar. This economic news shows the health of job creation and unemployment trends in the US. Where the first three types of news I have described can be, more or less, predicted before they occur random news is that which can not be predicted. It could be a surprise change to earnings guidance, a surprise interest rate hike or unexpectedly good or bad economic news but could be anything not expected or foreseen by the market such as a lawsuit, product recall or change in company management. Random news can also be a rumor. Take for example OPEC and oil prices. When OPEC makes an announcement that they are considering a cap to production it can have a positive effect on oil prices regardless of whether they actually cap production and the actual state of supply/demand fundamentals. If OPEC were to follow through on such a cap that would be fundamental news.his surprise news is unexpected and random, but also fundamental to the price of oil. 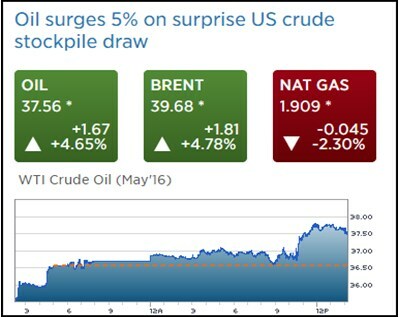 This surprise news is unexpected and random, but also fundamental to the price of oil. Where Do You Get All This News? I am sure by now that more than one of you reading this is asking the question “with all this news where do I find it, how do I keep up with it?”. The answer to that is twofold. First, for the most part, all news is widely disseminated, that is, it is spread across the internet in way that make it available to as many people as possible. There are dozens, hundreds, of news sources but when you boil them down to their essence all are saying the same things. Some will give a different spin, or a different opinion or angle but at heart the news is the same. Information about Ford earnings or a central bank meeting in the first quarter listed on CNBC will not be substantially different than that listed on Forbes, CNN, SeekingAlpha, YahooFinance, ForexFactory or any of a number of other sites. What you have to do is find one or two sources that you trust, enjoy and then use them. Some sites are more focused on stocks, or commodities or forex and that is OK. If you like it and the information is timely it is an OK source of your news. Of course, you can always go directly to the source and receive updates from corporate websites and/or economic data as it is released by governmental agencies. Now, how do you keep up with it? This takes a little time but don’t worry, you don’t have to become a newshound overnight. Start slowly, follow economic releases, follow earnings news, follow random news until you begin to get an understanding about what is going on the world. If the first thing you read is that the FOMC is about to raise rates that could sound scary… but over time, if you have been following the news, you may realize they have been on the verge of raising rates for over a year and that there is little expectations it will happen at the next meeting, not so scary. The same is true with every type of news. Start slow, read articles each day or each week that talk about the economy, earnings, fundamentals etc and you will eventually gain perspective on events and be able to form your own opinions. An example from my personal life; I began following the weekly US unemployment claims about 5 years ago. At first the data meant very little to me but over time I gained insight into the trends, where they were going and how other economic data affected them. Now I am well versed in US employment trends and can apply those trends to my trading on a week to week basis. The economic calendar is one of the most useful tools for news traders. It is a listing of all economic releases around the world, by country and time. These calendars are available across the web and can be easily found at forex trading websites. A really good calendar will include the country, the release, the time it is expected, the last released data, the expected data and even sometimes how that data should be expected to affect the market. Things like job creation, GDP or central bank meetings tend to have a larger impact than events like PMI or trade balance. There is even an economic calendar tool for MT4 which will display on your charts when and what data is expected to be released on a given day. I am sure there is no doubt that news, and trading the news, is a good way to get signals for binary options trading. The problem is how to trade it. Some traders will tell you to avoid news releases because of the unpredictability and volatility associated with such events. This is probably good advice, but should be taken with perspective. You will probably not want to enter a trade just before a known news event is released but trading after the fact is often highly profitable as positive or negative news will move the market. Not to mention the fact that the news is what helps to set trends, they don’t just appear out of nowhere. Something else to consider is that not all news will affect all assets. A change in oil inventory will affect oil prices, but probably not gold prices or stock indices. This is why it is important to know when news is expected, what kind of news is expected and how the news may affect the market you are trading. Our pro, Okane, is adept at news trading and has written many articles on the subject. His strategy is to identify a potentially market moving new release for the asset he is trading, wait for the information and then take valid technical signals once the announcement is made and the market is moving. Yet another thing to keep in mind is that bullish or bearish news releases do not neccesarily mean you should trade in that direction. Say for example the trend is up and has been moving higher for days or weeks. A bearish news event may stop the rally and cause prices to retreat but one news release does not a new trend make. It is more likely the bearish news will provide an entry point for new bullish trades once the trend reestablishes itself. Regardless of how or if you choose to trade the news it is important to keep up with it. The news is information about the market and individual assets that you need to know in order to make well informed and profitable trades. Just look at the chart below. It shows the movement of gold as influenced by the central banks.